When you start to evaluate your health—examining the outward signs, analyzing how you feel, thinking about how you know you could improve your diet—your mind (or your money) often goes straight to supplements. In the last few decades, the vitamin and supplement industry has boomed, going from serving a niche market to being a massive money-maker providing capsules, powders, and more for health-seeking people everywhere. Each vitamin, mineral, algae or enzyme comes with the advertised promise of symptom relief, cancer prevention, bowel movements like a dream, or something similarly worth fantasizing about. But to create a supplement that truly takes your health to the next level requires intention, precision, and care, not to mention an in-depth knowledge of nutritional science. If you haven’t yet discovered HealthForce Nutritionals, you’re in for an awakening. 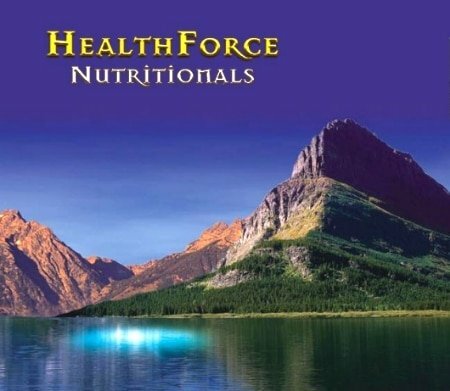 A grassroots company born of the dream of couple Jameth Sheridan (Doctor of Holistic Medicine) and Kim Sheridan (Naturopath), HealthForce Nutritionals has been working since 1990 to provide supplements that bless your body with maximum potency and absorbency. Their method is precise, their vision unwavering, and their products surprisingly delicious in addition to nourishing. We keep our office stocked with their superfood powders, so we always have some ready to throw into a smoothie. We love these products so much, we decided to feature HealthForce Nutritionals as this month's We Heart. While the rest of us were learning about pesticides, realizing we didn’t want them in our food, and henceforth cautiously guarding our cart from all things nonorganic, Dr. Sheridan was developing his own standards for natural sourcing. HealthForce states that they completely appreciate the efforts of those who have fought for organic agriculture standards, from the passing of the Organic Foods Production Act in 1990 to 2013’s mandate that certifiers must perform pesticide residue testing on at least 5% of their certified crops. For them, allowing any pesticide residue to slip by is not an option. They wanted to do it better. Truganic™ is HealthForce’s own standard for pesticide-free ingredients. Every product is put through periodic testing for pesticides, insecticides, herbicides, GMOs, and irradiation, with a zero tolerance policy. Because many of the ingredients they source come from all over the world, some fluctuate seasonally between being certified organic, wildcrafted, or naturally grown without pesticides. Each grower they work with must pass their TruGanic™ standards, or else no deal! When you’re nagged to “eat your greens,” you probably default to leafy greens like spinach or kale. Did you know that cereal grasses can also be used in a supplement to dramatically increase health? High in nutrients, especially alkalizing minerals, these grasses make a good addition to your diet. HealthForce uses them as both whole leaf and dehydrated grass juice powder. Whole leaf grasses have cell walls made of cellulose that make them indigestible to us two-leggers. Determined to harness their full benefits, Dr. Sheridan worked for years to develop a grinding process that breaks down almost 100% of the cell walls, without using any heat! The result is bioavailable nutrients—nutrients that your body can actually use. This is a real concern when buying supplements of any kind. Dietary supplements do not need FDA approval before they are marketed. When you buy a supplement, you are trusting that the company is honest about what’s in the product. Even if the ingredients listed are truly what’s inside, the potency and effectiveness are still of question. Most mineral supplements you buy contain minerals in the form of inorganic salts. Some are chelated, which means they are processed with an acid to make them more bioavailable. Even when made more bioavailable, these minerals are not in the ideal form for absorption. Cofactors our bodies use to metabolize minerals are lost when minerals are isolated from the foods they naturally occur in. Though your body is still able to utilize some amount of the minerals, this form is more likely to create toxic buildup. What was HealthForce’s answer to bioavailable minerals? They feed inorganic mineral salts to a yeast culture. The yeast consumes the minerals, which then become incorporated into the yeast food matrix, and thus recognizable and usable by your mineral-hungry bod! The yeast also provides B vitamins and immune-boosting beta-glucans. If you’ve gone through all the trouble to make your supplements truly pesticide and chemical-free, bioavailable, and potent, you surely don’t want your goods ruined by toxic packaging! HealthForce Nutritionals are just as stringent with the way their products are packaged as they are with what’s inside them. Their EcoFresh Nutrient Lock Packaging™ system starts with an amber glass bottle that is resistant to UV rays, does not off-gas, and is recyclable. A metal lid with a rubber seal keeps things airtight, with an oxygen absorber to prevent oxidation of the bottle’s contents. Like the rest of the work this company does, the way they package their supplements is thoughtful and thorough. Voted “Most Likely to Make it Into My Next Smoothie” in the Annmarie Gianni Skin Care office, Vitamineral Green™ is a green superfood powder that we highly recommended. If you’ve ever taken a vitamin and felt cheated out of your money when you peed it out an hour later (you know what I’m talking about), you might want to give this Actual Food™ powder a try. Another HealthForce trademark, Actual Food™ refers to what we mentioned earlier—nutrients that are digested by yeast and exist in a natural food matrix that is highly digestible by you. We’ve got to say, we agree! What we love about this product is that you can throw it in a smoothie without compromising the taste. On those days where I’ve run out of greens and my “green smoothie” runs the risk of being nothing more than a sugar-laden fruit concoction, I throw some Vitamineral Green™ in there and rest assured that my beverage is breakfast-worthy. The business model that HealthForce Nutritionals has created is based on a passion for health that is clearly at the forefront of both Jameth’s and Kim’s lives. It’s hard to talk about this company without sounding like too much of a cheerleader. It’s just that uncommon to hear about a company who is so committed to being thorough and creating the best supplements possible! Plus, who doesn’t love a catchy trademark like Truganic™? Interested in adding some superfoods to your diet? Click here to browse their delicious product line! We Heart is a monthly column. Click here to subscribe. Click here to see who we've loved so far!